Dear Aftab saab is ustad Barkat Ali khan was the mentor of Gulam ali saab the famous gajal singer. Subrata: He was his younger brother, not his mentor. His mentors were his father Ali Baksh Khan and his uncle Kale Khan. 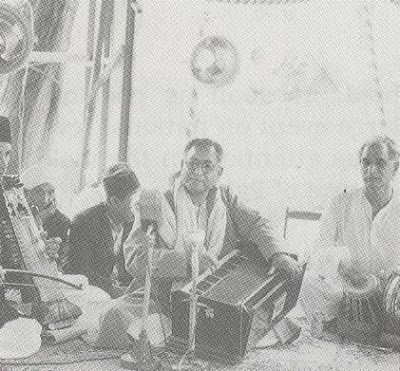 bhisham ji subrataji has said that Ustad Barkat Ali Khan sahab was mentor of Ghulam Ali(ghazal singer). Yes as well as he was mentor of Begum Ajhtar, Mahendi Hasan and many more..
Ustad Barkat Ali Khan (1905-1962) has left a lasting impression on various genres of Hindustani light classical music. He was younger brother of Ustad Bade Ghulam Ali Khan. By several accounts Barkat Ali Khan was a superior Thumri singer but had to content himself by playing second fiddle to his elder brother. After partition of India, Barkat Ali Khan migrated to Pakistan and concentrated on the lighter aspects of Hindustani classical music. He made a great contribution to North Indian light classical music. He was acknowledged as one of the greatest Thumri, Dadra, Geet and Ghazal artists. His outstanding rendering techniques of Purab and Punjab Ang have no match. He captured the audience all over India and Pakistan with his unique style of music. Click this link of an extra ordinary blog on Hindustani classical music. No he was Bade Gulam Ali Khan Saheb’s younger brother, as far as I know. Barkat Ali Khan was superb in Thumri. His rendition reminds us of Bade Ghulam Ali Khan, his elder brother. Thanks. I personally know Ghulam Ali, Ghazal Singer. His father was a sarangi player and was greatly impressed by Ustad Bade Ghulam Ali Khan, so much so that he named his son after the Ustad and brought him to Ustadji for Shagirdi which was done. It was because Ustadji was rarely home due to his concerts far and wide, Ghulam Ali was left in the care of Ustad Barkat Ali Khan and that is why Ghulam Ali’s style is more reminiscent of Ustad Barkat Ali Khan than his Ustad. This was told to us by Ghulam Ali himself. After this he rendered Ustadji’s Thumri – Saiyaan bolo, in truely Bade Ustad’s style that left all of us with eyes wet including himself. And he always says, “Mein khushkismat hoon, mujhe 2-2 Ustaandon ki rahnumai mili hai.